Manila, Philippines. Religions for Peace Interfaith Youth Network renewed its commitment to addressing climate change through concerted efforts based on multi-faith cooperation in the 3rd Asian Religious Youth Peace Camp with the theme “Responding to the Marginalized Communities’ Vulnerability to Climate Change: Strengthening Common Actions and Empowering Asia-Pacific Interfaith Youth Leaders” on November 17th to 20th 2016. At the conclusion of the youth camp, the religious youth leaders launched the campaign “Our Earth, Our Responsibility — RfP Multi-Religious Youth Action on Climate Change.” The campaign includes environmental awareness workshops, children’s resiliency program during disaster, mangrove planting, use art to raise awareness and environmental sensitivity, and others. The conference brought together sixty multi-religious youth from five religions: Buddhism, Christianity, Hinduism, Islam, and Judaism; and twelve countries: Australia, Cambodia, China, India, Japan, Mongolia, Myanmar, Nepal, Philippines, Pakistan, South Korea, and Sri Lanka. 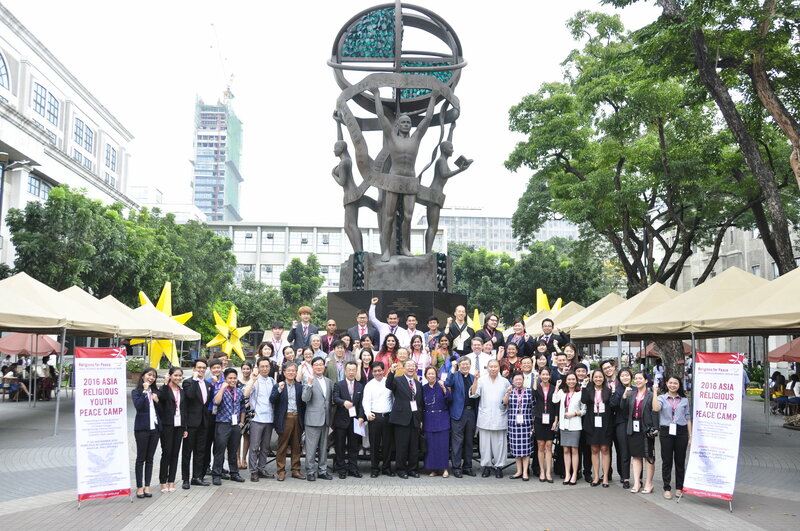 The camp was hosted by the ACRP Seoul Peace Education Center (SPEC) and jointly organized by Religions for Peace Asia & the Pacific Interfaith Youth Network (APIYN) Religions for Peace Asia/ACRP, and Religions for Peace Philippines in cooperation with the University of Santo Tomas. They recognized that climate change is a global problem. In particular, the host country for the 2016 camp, Philippines, faces the greatest threats due to the impact of environmental damage, caused by climate change and rising global temperatures. At the opening ceremony senior religious leaders shared their wisdom for the interfaith workshops of the youth. Hadja Lourdes Mastura encouraged the youth to “be bold, to be brave, and to be beautiful” in their work. Rev. Yoshitaka Hatakeyama paid tribute to the resilience of the Filipino people, who have experienced many natural disasters over the past decade including earthquakes, landslides, flooding and typhoons, and encouraged multi-religious youth to respond to the challenges of climate change. The President of the Korea Conference of Religions for Peace (KCRP), Rev. Yongjoo Kim, and the KCRP Secretary General, Fr. Kwangjoon Kim, congratulated the Asian Youth for this annual gathering and called on them to welcome the other in their common actions to respond to the vulnerabilities of marginalized communities. In the keynote lecture, Rev. Kyoichi Sugino, Deputy Secretary General of Religions for Peace International, emphasized the importance of multi-religious youth cooperation for preservation of the environment. Dr. Lilian Sison, Secretary General of Religions for Peace Philippines, elaborated on the scientific analysis of climate change globally and emphasized the adverse impacts of climate change on vulnerable communities and suggested cultivating a disciplined lifestyle and implementing awareness raising activities. Symbolically, religious youth leaders offered tree saplings to senior religious leaders as their pledge to commit to combating climate change. Youth delegates met with senior religious leaders at the Masjid Al-Dahab Golden Mosque in Quiapo. It is considered as the largest mosque in Metro Manila. The youth delegates carried out the clean up inside the Minor Basilica of the Black Nazarene. After the cleaning, Rev. Sugino addressed the congregation explaining the presence of the youth delegates, the importance of inter-religious dialogue. Rev. Msgr. Hernando Coronel, the Rector of the Quiapo Church, welcomed the delegation and spoke also on the significance of inter-religious dialogue for Christians by quoting Pope Francis. The Quiapo Church is home to the Black Nazarene. The Black Nazarene devotion is the most popular Catholic devotion in the Philippines. Millions of people would attend its procession during its feast day every January 9.